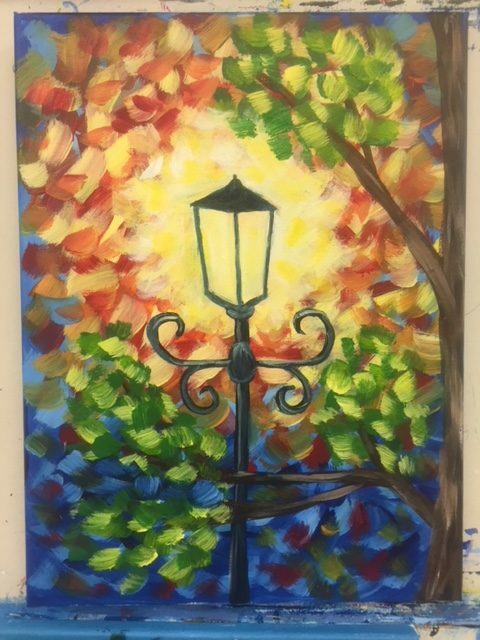 Schedule an Adult Painting Party TODAY! The most relaxing and entertaining concept for Adults in the world today! Everyone will be amazed by the masterpiece they will take home!! This session is made for beginners and experts to relax and have fun! – You got yourself a party!! Bring your own food and drinks, decoratee as you wish, set the music you like! Dancing, Karaoke, and MORE!!! Due to the Holidays – The Art Station painting class schedule has been altered for the month of September. No Camp Week – Art Classes! Summer Camp is over? No worries! Special Classes during the week of 08/18 – 08/24 at the Art Station! The Art Station on Ave U, Brooklyn, NY, is hosting a series of special classes this week. We know, as a parent, it’s difficult to manage work and family in the last weeks of summer break. That is why we are have classes every day we are open this week. 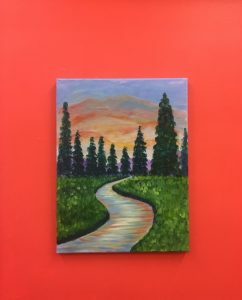 Adult Painting Class – Paint n Relax is Back! 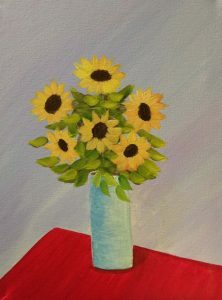 Our adult painting class has returned! Join us for this Wednesday, Paint n Relax. 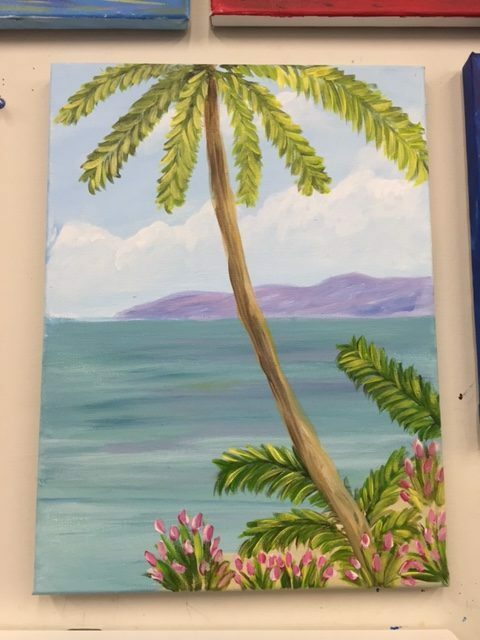 Our unique adult painting class, also known as “Paint ‘n’ Relax” is the perfect memorable night out to discover your inner talent. Surprise yourself with your very own work of art! Open to all adults, for all levels of experience or no experience at all! We highly encourage first-timers. Please call us to reserve your seat!! Price includes all materials: brushes, paint, easels, 16×20 canvas, palettes and aprons. The session includes step-by-step instruction by the artist from start to finish. 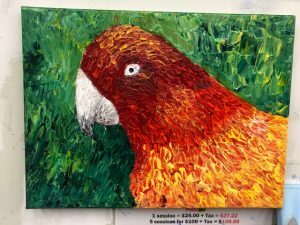 You will learn about mixing colors and various brush and painting techniques. 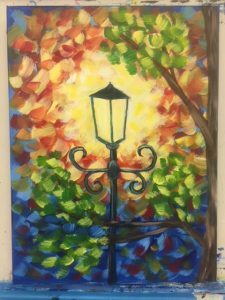 This week’s adult painting class features a colorful painting of a lamp post among beautiful leaves and light. Art Station is the best Party Place in Brooklyn! 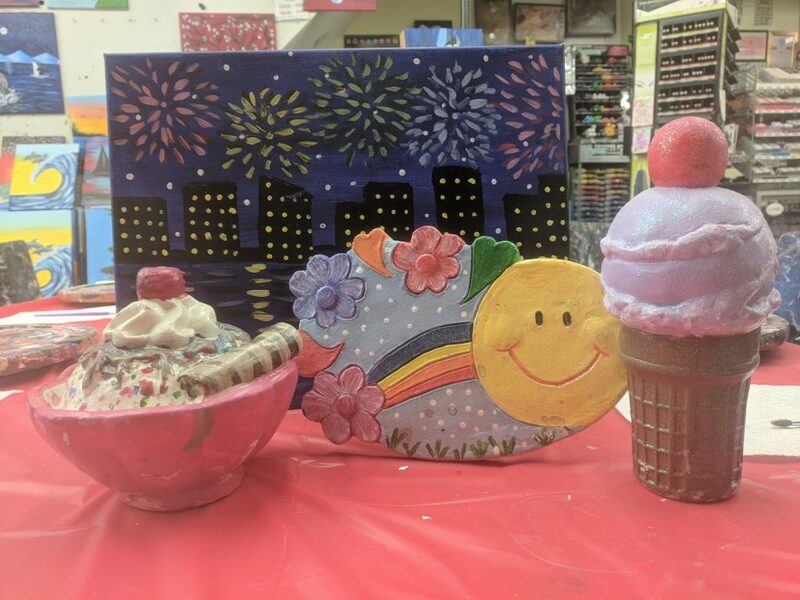 Art Station is one of the most unique of all kids birthday party places, as we offer a wide range of painting party ideas for infants, toddlers and teens in our private party room. Capable of holding up to 50 people seating or 100 standing, if there is an occasion – there can be ART. 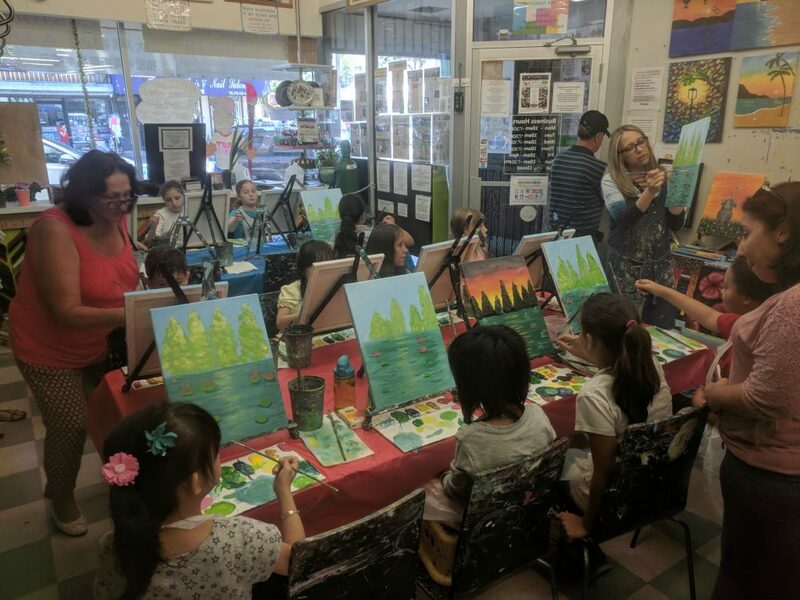 Our party packages are designed to give the right amount of attention to both the host and the guests while they create artwork along with music, good food, and tons of other fun activities. The atmosphere at Art Station is fun and fosters creativity. Plus, you will have the added benefit of enabling your guests to choose art-related gifts at our gift shop. Other kids birthday party places don’t offer the unique Paint and Cookies sessions that we do! Take advantage and book your next kids birthday party with us! ANY visitor will automatically get 15% off on all art and craft supplies! 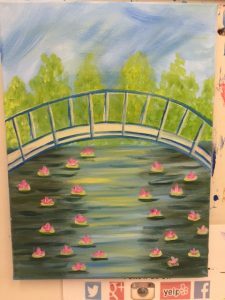 For the adults we also offer our painting party packages here. To book an event or for more information, please contact us at 718-645-4545 . THE ART STATION IS HAVING A CLEARANCE SALE ON PHOTO FRAMES! Come to the Art Station to buy pre-made photo frames at 40% off the listed price! All day Sunday, rain or shine, we will be selling all of our photo frames at huge discounts! We also offer in-house custom framing. A large number of beautiful moldings, mats, and glasses are available for your art and photography. The frames are construct with care and precision by our master framer, Shlomo Harari. If you are interested in purchasing a custom frame, bring your artwork or photographs or store for an estimate. Our kids art classes, also known as “Paint and Cookies” is the most unique art program for kids ages 5-16 in Brooklyn. Since we opened in April 2013, over 10,000 kids have joined in on the fun, and most of them are weekly students! Whats special about our kids art classes is the sessions only last 1.5 to 2 hours and the students walk out with a finished painting on the spot! The students take a “cookie break” in the middle of the session (snacks/drinks are on us!) The perfect way to introduce painting to your children is through our kids art classes in Brooklyn NY! Your child will learn from the painting class about mixing colors and various brush and painting techniques. The class walks your child through the painting process from start to finish by step-by-step instruction. Please call ahead of time to reserve a seat for your child and allow our class to run smoothly. In addition Kids Birthday Party are held in the back your choice of canvas or plaster painting. Happy Fourth of July from the Art Station!! We are celebrating the Fourth July at the Art Station, and we would love to celebrate with you! 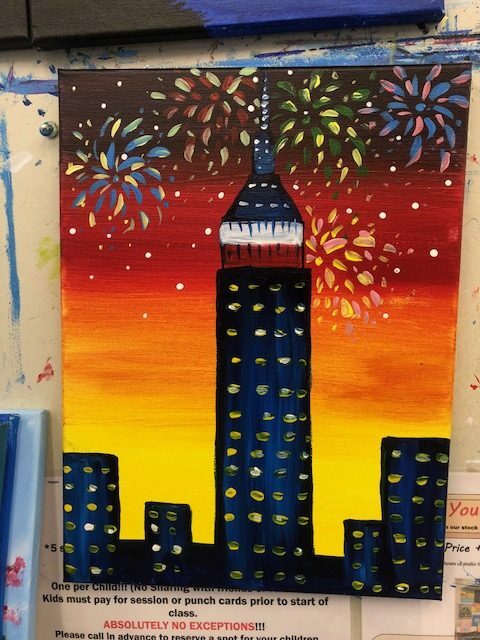 This week’s Paint n’Cookies Kids’ Painting Class will be paint fireworks over the Empire State Building. Feel free to come and paint on your own or paint one of our plaster!